When gin started becoming the talk of the town, this secret little gem popped up. Tucked away in the secret mediterranean-style courtyard of Honest Chocolate, The Gin Bar boasts 118 gins from all over the world, with 52 of them being produced locally. Sit back and relax as the bartenders immerse you in their selection of local and international gins. Learn to identify a myriad of botanical flavours, and experiment with different mixers and garnishes. The vibe here in the early evening is a relaxed speak-easy atmosphere, becoming more of a stand up venue with the hustle of locals and tourists as the sun sets. Originally an embalming room of a mortuary, the drinks are inspired by the history of the building, offering elixirs to cure a manner of ills, from calming your soul to soothing your heart or stimulating your ambition. With something for everyone on their extensive drinks menu, one of their most popular cocktails is a House Remedy Gin & Tonic called ‘Ambition’, said to cure important things such as impulse buying, arrogance, big car syndrome and lust. Pienaar & Son is a small craft distillery in the centre of the Cape Town City Bowl, and a marvel for steampunk fans. Founded by ex-rocker André Pienaar and his dad Schalk, they have created a whole new kind of gin-volution. Developing their gins using cutting edge nerdy engineering principles, they hand craft their spirits with science and art to start new traditions, and it seems to be working. Pop into their gin lab every Saturday from 10am – 2pm to learn all about the gin-making process with a tour of their distillery and find out how this dynamic duo use their creativity and personalities to make these delicious gins. 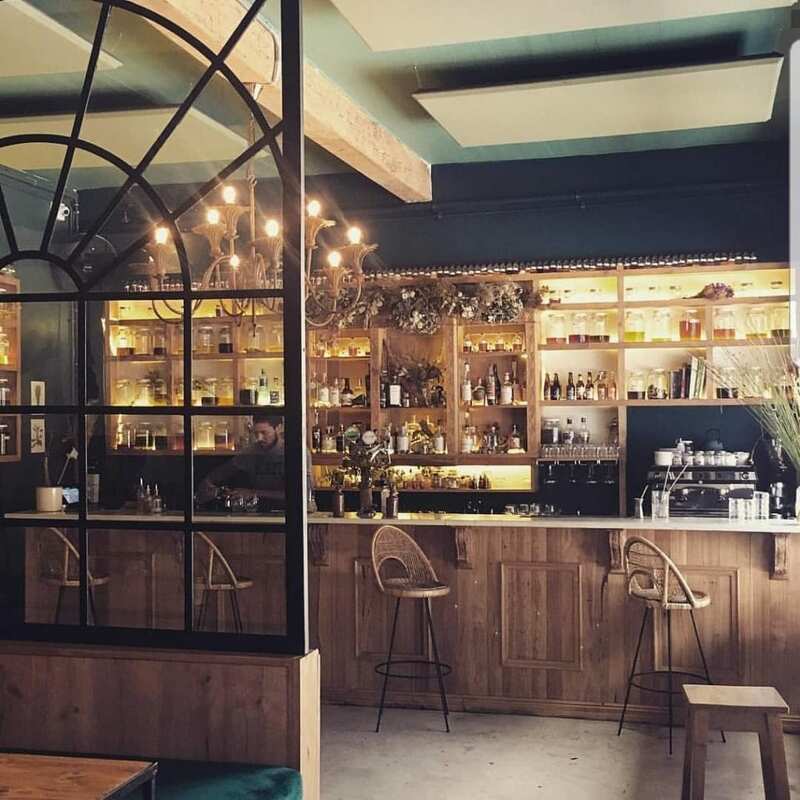 Opened in March 2018, Botany is a beautiful upmarket cocktail lounge tucked away in the leafy suburb of Newlands, Cape Town. A popular spot for after-work drinks, this cosy lounge is tastefully decorated along a botanical theme, perfectly suited for its gin companionship. Choose from over 34 craft gins or get yourself a glass of bubbles, a craft beer or wine by the glass. A tapas menu is also available for those wanting some small nibbles, with the gin and fennel mussels with Turkish loaf being a must-try dish. Hope on Hopkins is located in the heart of Salt River, and is Cape Town’s first artisanal distillery. If you are eager to brush up on your gin knowledge, and get a peak into the world of refining these tasteful spirits an artisanal gin tasting at Hope on Hopkins Distillery has to be at the top of your list. Owners Leigh Lisk and Lucy Beard are knowledgable and passionate about the craft and the complexities that come together to create the botanical flavours. With three flagship gins designed to take you on a botanical adventure, expect to leave the tasting loving gin even more than before. Starting with the classic London Dry visitors then move onto the more contemporary Salt River gin which has dominant fruity fynbos flavours of Buchu. Next up is the Mediterranean Gin which is their most experimental and unusual gin of the three. A savoury gin with olives and herbs dominating finishing off with cardamom and orange, this one is bound to get your tastebuds tingling. Cause Effect is an Experiential Cocktail Kitchen & Brandy Bar inspired by Cape Town’s unreal natural wonders – the fynbos, oceans, vineyards and mountain. If mixology is right up your alley, you’d best make your way to the Cause Effect Cocktail Kitchen in the heart of Gardens. Here, Kurt Schlechter, Siavash Marshall and James Phillips have joined their mixology forces to blow everyone’s mind with tricks and tips. The gins on offer are playful and experiential, full of thought and flavour and their extensive range of cocktails are all made using natural, foraged ingredients. They also make all of their own bitters, liqueurs and flavourings. Guests can expect unicorn mugs covered in candy floss, glasses overflowing with mist and delicate fish bowls – a cocktail spectacle! The Botanical Bar is all in the name, famous for its botanical-flavours in drinks and snacks. If you’re looking for a city spot to hang out with your friends over a delicious cocktail they are refreshingly original and there are multitudes of options that have been constructed with local craft gins as the hero, highlighting the finer flavours of the Cape Floral Kingdom. The real winners are the drinks made with these shrubs, a fruity mix that is partnered with gin and topped up with soda water. The focus at the Botanical Bar is on foraged local ingredients used in their homemade bitters, liqueurs and herbs. Don’t miss out on their tasty bar snacks that pair incredibly well with a GnT. Looking to kick off your weekend in style? Look no further, The Conservatory at the 12 Apostles Hotel and Spa is the ideal romantic date night spot or just a stunning way to swing into the weekend. Your evening will look a bit like this… top-class gin mixing and tasting experience, overlooking the gleaming Atlantic ocean while the sky turns hues of pink and purple. Experience world-class gins while learning all about the different styles and tuck into delicious canapés. At the end of the evening you also get to take home a small bottle of your personally handcrafted gin. The vine gurus at Asara Wine Estate and Hotel in Stellenbosch have recently added their touch of sophistication to the gin sphere with the Sansibar Gin Lounge. The atmosphere at this boutique gin bar and terrace teems with contemporary opulence and uninterrupted views over the valley and surrounding mountain range. Their selection includes some 260 gins imported from countries around the world including Japan, Scotland and Canada. For those wanting to taste quite a few of the gins from their vast collection, Sansibar offers a gin tasting session of 4 different gins from 4 different countries priced at R195. A great way to experience the diversity of gins from around the world! Producers of delicious Fynbos infused blends such as Rooibos, Buchu, and Honey Bush, this micro-distillery produces one-of-a-kind South African gins. Founded by Simon Von Witt who radiates passion for gin-making, he believes that this iconic drink is far more than the classic take with juniper berry infused alcohol. Simon has distilled his unique Fynbos gin that caters to the finest palates and is a true reflection of South African heritage. Gin tastings can be enjoyed at the micro-distillery for only R50 (bookings are essential). The Willaston Bar at The Silo Hotel in the V&A Waterfront is the perfect option if you are looking to sip on a GnT with the most surreal views of the Cape Town city and Table Mountain. The bar setup is classy and elegant, and has a relaxed and luxurious ambience with hexagonal windows that are the perfect Instaframe for your cocktail sunset pictures. Take your loved one here for a romantic after dinner drink, or get here early to enjoy the views of the sun going down over the city. With more than 30 gins available, 25 are local South African craft gins. They also stock a range of different tonics to pair with the gins, offering flavours like hibiscus, basil and elderflower. With the above places being just a small selection of Cape Town’s gin go tos, there are so many more to be discovered! For those wanting a truly immersive experience into South Africa’s gin scene, be sure to book our gin experience during your visit to Cape Town.